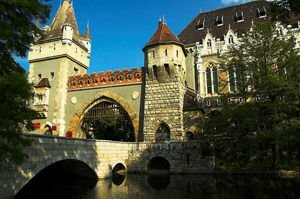 Vajdahunyad Castle is one of the main tourist attractions in the capital of Hungary - Budapest. This beautiful palace is located at one end of the park in the central part of the capital. The park is a gathering of buildings of architectural past of the city. You are able to see the ancient church and medieval castle of the Transylvanian type or richly decorated building in the Romanesque-Gothic and Renaissance-Baroque style of agriculture museum - the largest in Europe. Here is situated the house of János Hunyadi, preserved in the authentic form. All of the castle is surrounded by water, visitors here are typically returned to the medieval atmosphere. The palace was built from 1896 and 1908, and his architect is Ignach Alpar. Vajdahunyad Castle was built on Transylvanian castle, which bears the same name. The difference between the two noble buildings is visible, the castle in the center of Budapest is a unique combination of several architectural styles - Romanesque, Gothic, and also are found typical Renaissance and baroque motifs. The story about the construction of of the castle Vajdahunyad is actually quite intriguing and unusual. In 1896 to celebrate the millennium of the arrival of the Magyars an exhibition was made to construct a castle from cardboard and wood, which became very popular. Subsequently it was decided to build a real castle of stone and brick. The model and real castle are similar to the Romanian Hunyadi Castle, hence the name of the castle. Vajdahunyad was finalized in 1908 and now houses the Museum. Several years after the exhibition ended, all the artifacts were returned to their legitimate owners. Today, the museum exhibitions offer the visitors an opportunity to learn about animal husbandry, forestry, fishing and the local wine industry. Against the Vajdahunyad Castle is the beautiful building and urban bathroom - a unique blend of Greek and Roman ways of bathing, a real cradle of what is now known as personal hygiene. The inner courtyard of Vajdahunyad offers an outdoor pool, which in 1960 was adapted for use even in winter.